I've been really enjoying using a few products lately, so much so that I think they deserve a blogpost. There's nothing fancy here, just some simple products that I've been reaching for every day. Loreal Gentle Eye Make Up Remover. I really like this offering from Loreal for removing my eye make up. All I have to do is soak a cotton pad in the remover and it removes all of my eye make up with ease. It's very gentle and doesn't sting or irritate my skin. It's also suitable for contact lens wearers which I thought was worth mentioning. It's a simple product that does it's job well, I shall definitely be repurchasing. I never thought I would be blogging about this but I have developed a genuine love for it. I blogged a while ago about my winter skin woes, and how the Avene Rich Recovery Cream was helping to moisturise my seriously dry skin. Unfortunately my skin continued to worsen with the bad weather, and I just could not get rid of the patches of dry and flaky skin on my face. I used up all of my Avene Cream in no time and just couldn't justify the expense with going through it at such a fast rate. On a complete whim I picked this up in my local supermarket, and I'm not being dramatic when I say I havn't looked back since. I was going to get a the original Nivea in the blue tub, but went for this as it specifically said "face" on the tub (I always feel weird about putting a body cream on my face, not sure why....) I use it in the morning and at night and my skin has never been as soft. It's an inexpensive boring product, but it's super moisturising, doesn't break me out, you get loads of it and it has made a huge difference in in the quality of my skin, and that for me makes it worth mentioning. One of the best foundations I've used in a very long time. The list of positive things I could say about this product is endless, but I'll attempt to keep it brief. It gives the most gorgeous finish on the skin, doesn't break me out, or break the bank. It's a light but build-able coverage foundation that isn't heavy on the skin, is easy to apply and blends like a dream. The shade matches my skin perfectly, (52 Vanilla) it isn't drying and lasts for most of the day. I absolutely love this foundation and would highly recommend it. Quite possibly my favourite glitter polish to date. If you love glitter and you don't own this nail polish, you need it. It is quite simply the perfect holographic glitter polish. Easy to apply, looks great alone or over the top of another polish, and only costs a fiver. What more could you ask for? A slight movement of your fingers in the light casts a rainbow of holographic glitter across your nails *happy sigh* It is however extremely difficult to photograph so I've included a couple of out of focus shots to try and get across the true intensity of the glitter in the right light. It is like a little party in a nail polish and I love it. I'm loving ELF nail polishes at the moment and Benefit "Sugarbomb"
Oh that nail polish is lovvve. i remember getting a sample of that nivea soft when it first came out years ago and used it on both face and body and i loved it! not sure why i never bought a full size tub but maybe i should! I'm so lusting over the bourjois foundation!!! Thanks for sharing these products with your readers. I want the same nail polish!! 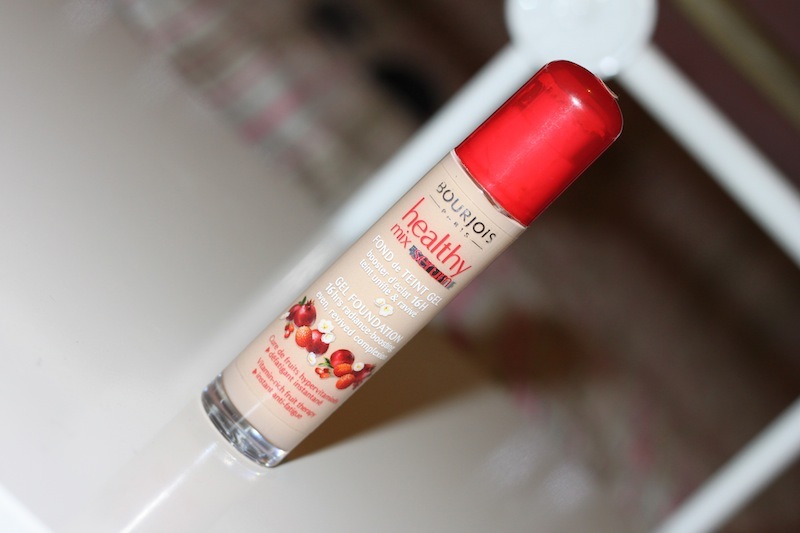 Bourjois Healthy Mix is one of my all time favourite foundations. I can't even think of one flaw to it! great post! absolutely loving my sigma f82? maybe f80.. stippling brush! That nail polish is a must-have for glitter lovers like me. I've been using Nivea Soft since the dawn of time, some days it is a bit too heavy, but it is really perfect for when you need serious moisturising. I've heard so many great things about that Bourjois foundation, I really need to get myself a bottle to try out.